The single-phase induction motor is started by using some methods. Mechanical methods are not very practical methods that is why the motor is started temporarily by converting it into a two-phase motor. The split-phase induction motor is also known as a resistance-start motor. It consists of a single-cage rotor, and its stator has two windings ? the main winding and a starting (also known as an auxiliary) winding. Both the windings are displaced by 90° in space like the windings in a two-phase induction motor. The main winding of the induction motor has very low resistance and high inductive reactance. The starting torque of a resistance-start induction motor is about 1.5 times full-load torque. The maximum or pull-out torque is about 2.5 times full-load torque at about 75% of synchronous speed. The split-phase motor has a high starting current which is usually 7 to 8 times the full-load value. Split-phase motors are most suitable for easily started loads where the frequency of starting is limited, and these are very cheap. These motors are used in washing machines. These are used in Air conditioning fans. These are used in small drills, lathes, office machinery, etc. Sometimes they are also used for drives requiring more than 1kW. Capacitor motors are the motors that have a capacitor in the auxiliary winding circuit to produce a greater phase difference between the current in the main and auxiliary windings. There are three types of capacitor motors. The capacitor-start motor develops a much higher starting torque, i.e. 3.0 to 4.5 times the full-load torque.To obtain a high starting torque, the value of the starting capacitor must be large, and the resistance of starting winding must be low. Because of the high VAr rating of the capacitor required, electrolytic capacitors of the order of 250 µF are used. The capacitor Cs is short-time rated. These motors are more costly than split-phase motors because of the additional cost of the capacitor. These motors are used for heavy loads where frequent start required. These motors are used for pumps and compressors, so these are used as a compressor in the refrigerator and air conditioner. They are also used for conveyors and some machine tools. This motor has a cage rotor, and its stator has two windings namely the main winding and the auxiliary winding. The two windings are displaced 90?in space. The motor uses two capacitors Cs and CR. In the initial stage, the two capacitors are connected in parallel. Two value capacitor motors are used for loads of higher inertia that requires frequent start. These are used in pumping equipment. These are used in refrigeration, air compressors, etc. 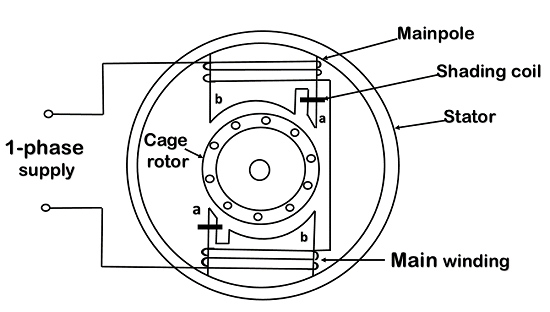 These motors have a cage rotor, and its rotor consists of two windings namely, the main winding and the auxiliary winding. The single-phase induction motor has only one capacitor C which is connected in series with the starting winding. The capacitor C is permanently connected in series with the starting winding. The capacitor C is permanently connected in the circuit at starting and running conditions. In this type of motor, no centrifugal switch is required. This motor has higher efficiency. It has higher power-factor because of a permanently-connected capacitor. It has higher pull-out torque. Electrolytic capacitors cannot be used for continuous running. Therefore, paper-spaced oil-filled type capacitors are to be used. Paper capacitors of the same rating are larger in size and more costly. A single-value capacitor has a low starting torque usually less than full-load torque. These motors are used for fans and blowers in heaters. It is used in air conditioners. It is used to drive refrigerator compressors. It is also used to operate office machinery. A shaded-pole motor is a simple type of self-starting single-phase induction motor. It consists of a stator and a cage-type rotor. The stator is made up of salient poles. Each pole is slotted on the side, and a copper ring is fitted on the smaller part. This part is called the shaded pole. The ring is usually a single-turn coil and is known as shading coil. 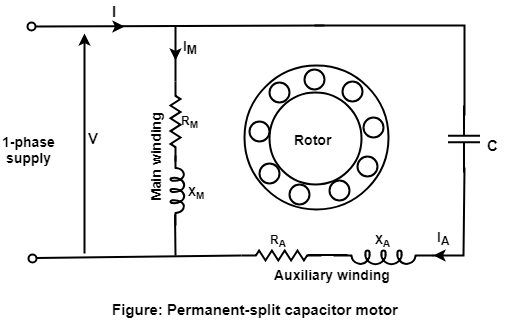 Figure: Shaded-pole motor with two stator poles. Shaded-pole motors are used to drive devices which require low starting torque. These motors are very suitable for small devices like relays, fans of all kinds, etc. because of their low initial cost and easy starting. The most common application of these motors is in table fans, exhaust fans, hair dryers, fans for refrigeration and air-conditioning equipment, electronic equipment, cooling fans, etc.